The advert local newspaper refused to print! 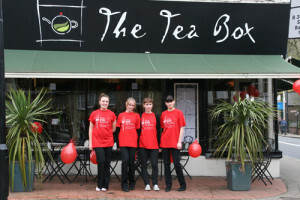 When The Tea Box opened its doors in Richmond-upon-Thames on 17 October 2007, the local neighbourhood was promised the tea house was “About to Cause a Stir”. Eight year’s on we nearly did with a planned media campaign we hoped would go viral following the publication of a proposed half-page advert in the Richmond and Twickenham Times to promote our tea cocktail range. From our Squiffy Earl, to our Irish Velvet and The Saint tea cocktail, not to mention our special celebratory cocktail The Torch for the Olympics, we love to explore the fun side of tea as the sun sets. On Friday nights and occasional Saturday and Sunday nights we turn into a mini tea bar with evening entertainment to sip your cocktails to, including poetry, storytelling and live jazz music. We are definitely are not all fur coat and no knickers! 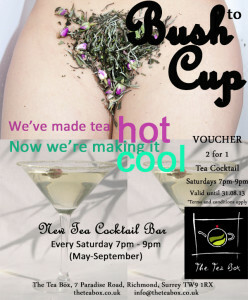 The advertising campaign to promote our tea cocktails, however, never got off the ground though as it was decided by the advertising executives at the local paper that, although they liked our proposed advert, they considered it a bit too risky for their readership and that it might on balance upset a few of their readers. Now we have our brand new website we can share it with the world for the first time. The Tea Box launches a fantastic new alcoholic tea cocktail, “The Torch” next week as part of its Tipsy TeaTM range to celebrate the games this summer. What better tea than Gunpowder pinhead green tea to set your summer a light? 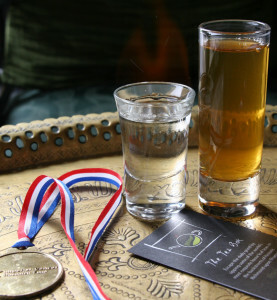 Tea sommeliers at The Tea Box have conjured up a magical experience9 using this exotic tea by using it as a chaser to a white Sambuca shot. Order “The Torch” and you will be served with a shot of Sambuca set alight to create your own burning flame for you to blow out before you throw back a double shot of Gunpowder green tea. The star-anise, liquorice and spicy flavours of the Sambuca combines with the smooth, warm, strong green tea to provide the perfect sensation. If you love Moroccan Mint tea and a tipple then this is the drink for you! The tea cocktail will be available for a limited period only during the summer of 2012 during the Olympic Games. Get hold of “The Torch” while it is on the special’s menu for £5.50 until September 2012. Sovereign TeaTM The Tea Box launches a gorgeous new loose leaf tea blend to mark the celebration of the marriage of Prince William and Kate Middleton on Friday 29 April. 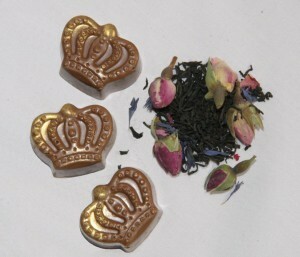 Taking the characteristics of both our future King and Queen and fusing them together, the blend provides a lovely display of beautiful pink whole rosebuds reminiscent of a truly elegant British rose such as Kate together with a scattering of regal blue cornflowers capturing the essence of our blue blooded monarchy. Both flowers are binded with an assertive base of bergamot reminiscent of earl grey underpinned with a solid black Chinese broken o range pekoe loose leaf tea. Like no other tea this fragrant and pretty blend has a distinctive full-bodied flavor that delights the senses. Once tasted, never forgotten; just like the Royal historic occasion itself. Did you know that drinking at least two cups of tea a day lowers the risk of ovarian cancer? To promote this, sisters Lorraine and Alison Kent from Teddington are holding a Make Time for Tea fund-raising event at The Tea Box, 7 Paradise Road, Richmond, Surrey TW9 1RX on the 12 April. The all-day event, in aid of the Eve Appeal which funds groundbreaking research into gynaecological cancers, will help raise funds for ovarian cancer research and boost awareness of the disease. This cancer is known as a silent killer, as there are no main symptoms, and if left untreated it can be fatal. Research, however, has shown that the antioxidants foun d in tea have been scientifically proven to limit the development of cancer. 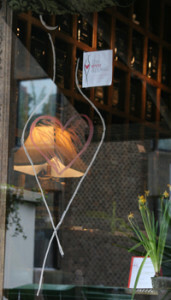 For every glass of Eve’s Temptation bought on the day, The Tea Box will donate 50p directly to the Eve Appeal. The specialist tea blend developed by The Tea Box is a mouthwatering blend of hot apple juice, white tea and ginger that provides the perfect spring detox. What’s more, if buy a 100g of any loose leaf tea or have one of The Tea Box’s lovely afternoon teas or high teas in the tea house, they will donate 10% directly to the appeal. Lorraine, Alison and The Tea Box are supporting The Eve Appeal because it truly is a silent killer that few people are aware of. We want to make this event as much fun and as rewarding as possible for everyone who takes part throughout the day purchasing pins and teas, as well as learning more about tea and its importance in maintaining a healthy well-balanced diet. We are holding it on Easter Sunday from 10am until 6.30pm in the hope it will raise more awareness of the disease while allowing as many people as possible to take part in the event. The Eve Appeal was set up to save women’s lives by funding groundbreaking research into gynaecological cancers. Its current focus is to develop effective methods of prediction, detection, treatment and care of ovarian cancer. The world-leading research that is funded by The Eve Appeal aims to identify techniques that could halve deaths from ovarian cancer. Publicly launched in 2005 with a target of raising £5 million in five years, The Eve Appeal is on course to achieve this target. For photographs of Eve’s Tempation, afternoon tea or tea packaging please contact jemma@theteabox.co.uk or on 020 8940 3521/07905 643 914. A small British tea house has won a legal victory against a powerful German corporate, over the use of its trade mark, which features a teapot logo. The Tea Box in Richmond, Surrey first opened its doors to the public in October 2007 as an alternative venue to the numerous highstreet coffee chains in the area. Just two months later the business became the focus of a legal challenge, led by a German tea manufacturer, part of the global Teekanne Group, over the registration of its trade mark. Teekanne claimed that the British shop’s application to register its teapot logo was a breach of their trade mark rights. With the help of trade mark experts at UK intellectual property firm, Withers & Rogers LLP, The Tea Box’s owners decided to contest the challenge. Now, after receiving an early indication from the UK Intellectual Property Office that it would be likely to find in favour of The Tea Box, the German business has decided not to proceed with its opposition to the application. “We are over the moon th at common sense, and not commercial power, has won the day. No one we have spoken to has perceived any similarity between the two companies’ logos. There is no way that people could confuse the brand of our independent upmarket tea shop which retails loose leaf teas with that of a large German tea business, which sells tea bags and doesn’t even have any tea shops in the UK. “It is great to have been able to help this small independent British business successfully counter a claim, which most people will view as unreasonable and heavy-handed. Christine Smart or Bailey Lamburn at Smarts on 0121 456 3199 or christine.smart@smarts.co.uk. 1. The Tea Box serves and sells a wide range of quality loose leaf teas, including its unique Frootea range and liquor teas. 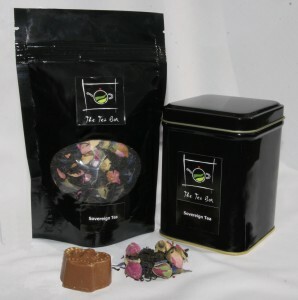 It is located at 7 Paradise Road, Richmond, Surrey TW9 1RX – www.theteabox.co.uk. Tel: 0208 940 3521. Established in 1884, Withers & Rogers LLP is one of the UK’s top ten patent and trade mark attorney firms providing expert advice on the protection and enforcement of intellectual property rights particularly for inventions, designs and trade marks. 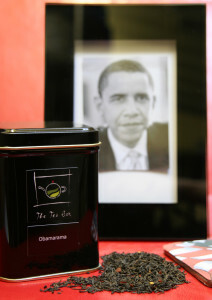 As the 44th President of the United States takes on one of the world’s most challenging roles during one of the world’s most challenging times, a new ObamaramaTM tea is launched today by The Tea Box to mark Barack Obama’s historic inauguration. A delicate balance of China black Keemun tea with crushed chillies, the ObamaramaTM gives tea drinkers a dark, smooth taste that’s full of character with a fiery passion in its tail. Just like the man himself. Perfect for those cold, winter days and nights, this wonderful new tea offers comfort just when you need it. Made from the most outstanding example of black Keemun tea in the last three years, this speciality house blend is sold in stylish black pouches and tins of 100g for £9.70 and £11.50 respectively. Available to drink and buy at The Tea Box, 7 Paradise Road, Richmond, Surrey, ObamaramaTM is set to feature in ‘Obama On My Mind: The Obama Musical’ at The Hen and Chicken Theatre, Islington (3 -21 March), written by American Emmy award-winning writer Teddy Hayes. The ObamaramaTM blend ushers in a new era of tea drinking that sees innovative tea blends complement traditional favourites such as Earl Grey and Darjeeling. We recommend you ditch the milk and stay healthier by putting a little fire in your cuppa instead. To receive a free Obamarama sample and/or for more information, please call Jemma Swallow on 020 8940 3521 or 07905 643914. The Hen and Chicken Theatre, 109 St Pauls Road, Islington N1 2NA. Box Office: Tel: 020 7704 2001. Jemma Swallow and Mike De Souza founded The Tea Box in response to a lack of establishments on the high street where you can purchase a great cup of tea. Providing the perfect antidote to a plethora of coffee shops, The Tea Box serves and sells a wide range of exquisite loose leaf teas and innovative tea blends using tea from some of the best tea gardens in the world. All teas sold in the tea house are served in individual teaware that celebrates the various cultures in which tea drinking has played a major part over many centuries – from India and China to Morocco and the United Kingdom. As well as providing a unique drinking experience, The Tea Box serves homemade cakes, traditional afternoon teas, cream teas, high teas, sandwiches and salads. Wine, cider, beer or champagne is also available for those who aren’t tea total. The Tea Box has a working conscience too. Every tea is ethically sourced and nearly all its products are locally sourced. While the tea house is open 7 days a week, its website www.theteabox.co.uk is open 24 hours for those wishing to register to discover the latest news on The Tea Box.